Working with our network of partners, volunteers and donors, Second Harvest Heartland is able to continually receive and distribute donations large and small into our 90,000+ square feet of dry, refrigerator and freezer warehouse space. 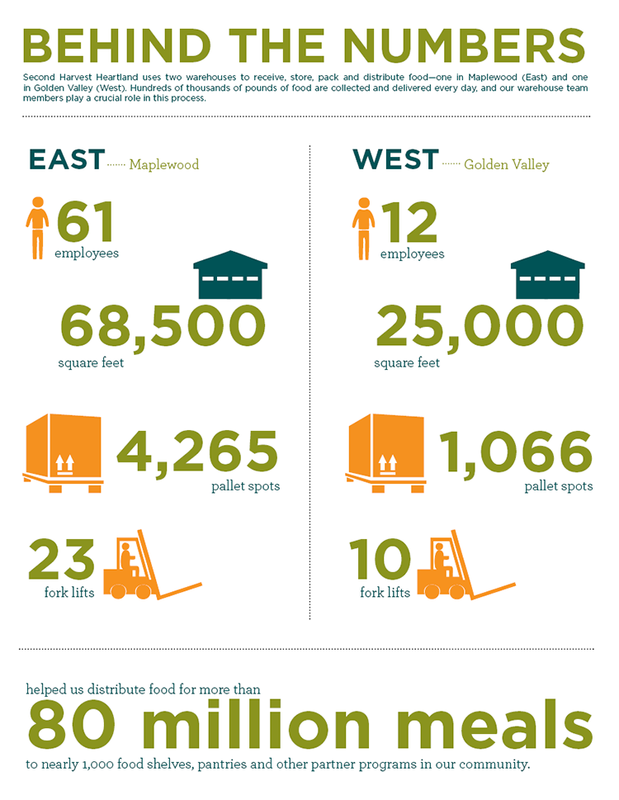 Our fleet of trucks travel nearly half a million miles a year, picking up food donations from warehouses in Maplewood and Brooklyn Park, and delivering them to more than a thousand food shelves, soup kitchens, homeless shelters, senior community centers and other meal programs in 59 counties across Minnesota and western Wisconsin. Our work to safely source and distribute food, including a growing amount of fresh food, presents many logistical obstacles. With a truck driver shortage and rising transportation costs, we face additional hurdles to transport food to hungry neighbors across the region. But with your support, we can address these challenges head on, ensuring that our food is safely delivered and that our driver fleet and gas tanks are full. Second Harvest Heartland believes that food changes everything. We work to provide reliable access to food to disrupt the vicious cycle of poverty, poor health and food insecurity. We’re committed to supporting the well-being of our hungry neighbors by distributing nutritious foods that clients need to live healthy lives free from hunger. We have developed a Healthy Foods Policy to guide our sourcing practices that is informed by the latest nutrition science and shaped by client surveys, feedback from our partners, and nutrition policies of other leading food banks. To learn what kind of donations we accept, see our FAQ. Food Bank and Food Shelf: What's the difference? Receives food from direct purchase and donations and stores it in warehouse, refrigerator and freezer space. Receives food from food banks like Second Harvest Heartland to distribute directly to their clients in need.